To Kelowna, B.C., for the Canadian Culinary Championships, a much-anticipated weekend that begins with a judges’ retreat that allows the judiciary to recover from a day of travel, to calibrate our palates and catch up with old friends. This year, Catherine Frechette of Tourism Kelowna organized a most generous night for us in a beautiful new property called Bottega Farm Inn, at the foot of the mountains to the south-east of the city. It was dark when I finally arrived and a light snow was falling but the inn looked most welcoming and merry. This was once a cattle farm but last year the owners completed a stunning modern building with ten luxurious rooms and a soaring dining room – a true relais du silence offering perfect peace and quiet. 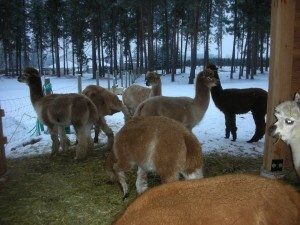 They also built a recording studio that is nearly finished and brought in a charming herd of alpacas to amuse the guests, though we had other diversions last night. Representatives from Tantalus and Cedar Creek wineries were pouring some delectable wines alongside elaborate displays from several local operations including Arlo’s Honey Farm, Okanagan Lavender Herb Farm and vegetable specialists Sunshine Farm. It was a very happy reunion for the judges. Our panel consists of the senior judge from every city where Gold Medal Plates holds an event – expert palates all. Let me name them from east to west. From St. John’s, Newfoundland, KARL WELLS is a broadcaster, food columnist for the Telegram and host of his own tv show, One Chef One Critic. From Montreal, ROBERT BEAUCHEMIN is a culinary author who writes for La Presse as well as being an anthropologist and a university professor. From Ottawa, ANNE DESBRISAY has been the restaurant critic of The Ottawa Citizen for 20 years and is also an author and broadcaster. From Toronto, SASHA CHAPMAN is an award-winning food columnist and food writer, currently an editor with The Walrus magazine. From Winnipeg, JEFF GILL is a professional chef and culinary arts instructor at Red River College. From Saskatchewan, CJ KATZ is an author, tv and radio host and publisher of Savour Life magazine. From Calgary, JOHN GILCHRIST is a teacher and author, broadcaster and restaurant columnist for The Calgary Herald. From Vancouver, SID CROSS is the wine and food guru for Western Living magazine and is a world-renowned wine and food judge. And also from Vancouver, ANDREW MORRISON is a writer, a teacher, a restaurant critic and the editor of Scout Magazine. He also serves as our culinary referee during the CCC, making sure the competing chefs obey our complicated rules to the letter. Our Kelowna judge is PERRY BENTLEY, Instructor in Baking and Pastry Arts at Okanagan College. The only judge not present last night was Edmonton’s MARY BAILEY, the wine, food and travel writer, certified sommelier and wine instructor and the founder of Edmonton’s Slow Food convivium. She couldn’t get away last night and will join us on Thursday. Need it be said, dinner had been prepared for us all, provided by a terrific local chef, Mark Filatow, whose restaurant Waterfront is currently undergoing a serious renovation, reopening in a month or two. I’ve eaten his food before and admire his work but last night he outdid himself. Dishes were served family style with passed platters – everyone helping themselves – and the menu was designed as a showcase of local produce. We began with salads of white and pink beets from Sunshine Farm in a creamy horseradish dressing, and cold grilled sardine fillets sharpened with Eldorado Farms tarragon vinegar and laid out over a slaw of cucumber, crème fraîche and preserved lemon. We moved on to perfectly cooked little slabs of soy-braised belly pork, the delicate crackling immaculately crisp, paired with pickled cabbage and yam noodles. The wines were very well chosen, including a racy Tantalus Riesling and Cedar Creek’s lush Platinum Chardonnay. Next came some ravioli that oozed runny egg yolk when we cut into them (that’s a neat trick of timing from Chef Filatow!) garnished with pancetta and soft broccolini florets. And after that we were blessed with Thiessen Farms quail, just the breasts, still pink and tender and fire-roasted, and the boned legs, cooked sous vide and as soft as the turned squash and pea-sized dates that accompanied them. Filatow emerged from the kitchen to pour on a rich jus from a tiny jug then sent out an extra dish of Pemberton farms beef tenderloin, aged 40 days, each slice showing the gradation of doneness from a crisp exterior to a ruby heart. The beef had its own red vermouth jus and a splendid array of Sunshine Farm’s heritage carrots, salt-baked cipolini onions and little sieglinde potatoes, baked and hollowed out then filled with their own mashed insides – they looked like tiny cupcakes. Tantalus’s 2010 Pinot Noir was sublime with the quail; Cedar Creek’s 2007 Merlot was ideal with the beef. 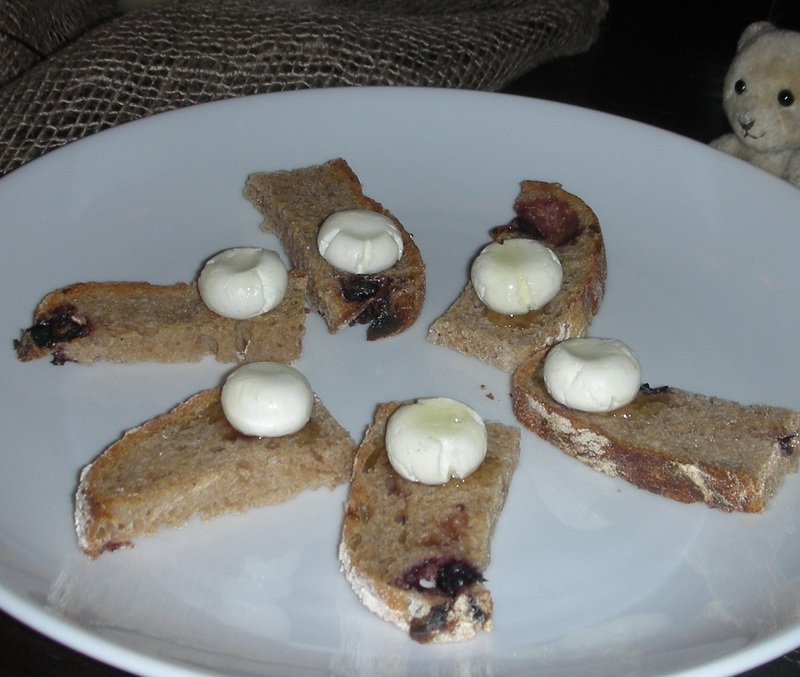 Our cheese course consisted of toast made from red fife and grape bread topped with a wee sphere of soft Happy Days goat cheese dressed with a marvelous honey from Arlo’s. Last year, Arlo’s owner, Helen Kennedy, explained, they had noticed that the honey from eight of their 106 hives was particularly pale and pure. The bees had been foraging on elder blossom and, indeed, there was more than a hint of elder amidst the wildflower aromas of the honey. So the evening progressed. We sipped an amazing wine from Cedar Creek with our dessert – called M, it’s a maderized Pinot Blanc, lightly fortified then put into small casks and left outside in the hot Okanagan sunshine for five summers. The only Madeira-style wine produced in the Okanagan, it’s a totally delicious amber nectar, the complex flavours and sweetness lifted by a sly acidity. At the far end of the inn’s great hall stands a Steinway grand piano. There are several fine musicians amongst the corps of judges but it was Catherine Frechette who was persuaded to play, from memory, Chopin’s Ballade number one – to thunderous and well-deserved applause. Tonight the serious work begins. What a wonderful description of CedarCreek Wines. We are so glad everyone enjoyed and we are so pleased that the “M”- Madeira-style wine was such a star of the evening. It is probably the only “M” made in Canada. But Yes, Canada makes more than ice-wine and we can’t wait for wine lovers to try the CedarCreek “M” and other great wines made in this country!